I'm a guitaraholic on the road to recovery. Just kidding. I'm on the road to buy another guitar. I'm also most likely looking for another pedal, cord, speaker, amp, pick, strap, case, rack mount gear, lighting and maybe even some recording or production software. I've seen requests for this type of file on a few forums. Well, I just happen to have a pretty large list of those cities and states at my disposal, so I'm posting it on HTMLMonitor.com for anyone to download. If you want any more data to go with it, just let me know. Otherwise, enjoy. You forgot the zips! Actually, a great source. I could create that file as well, though it's not quite complete. If you'd like it, I'll email it to you. So I was coding a form in Yii, and came across a situation where I had a value of 0111110 (no, yes, yes, yes, yes, yes, no) that I needed to pre-populate values in a multiple select drop down. This didn't seem like it should be that hard, but the Yii documentation lacked a bit there. The first step was to split out the string. Now, we create a blank array to hold our options. Then, we go through those options and set selected on the ones that need selected. Now, we render the drop down list. One of the things that has always bugged me is the excessive bandwidth that PDF's use when presenting schematics. We also have a fair number of users that aren't computer literate enough to understand what Acrobat Reader is, although this seems to be less of an issue lately. Many of our vendors only supply PDF's, and with the 1000's and 1000's of schematics we have it's just not a good option to manually manipulate each one. Enter ImageMagick. ImageMagick is available for many languages, but I prefer using Perl to manipulate the images. Most of the concepts will be the same regardless of language, even if the syntax is changed. So, to begin, I'll include the module and assign the path I want to convert files from. I've also bolded any items you may want to change for your implementation in all of the code snippets below. Marshall JMP-1. That's right, I found a vintage piece of gear with tubes in it which is the same model as Maiden themselves use. Sort of takes the guesswork out of getting the right tone when their settings are well documented online. 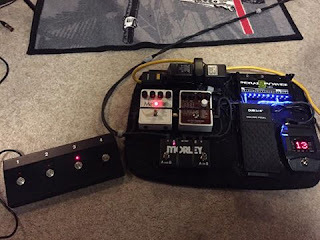 Both of the signal paths go to a side of my Marshall 8008, with an old school Digitech DSP 128+ adding a bit of verb and delay to the guitar side of things. Text-Link-Ads - You've been found out!